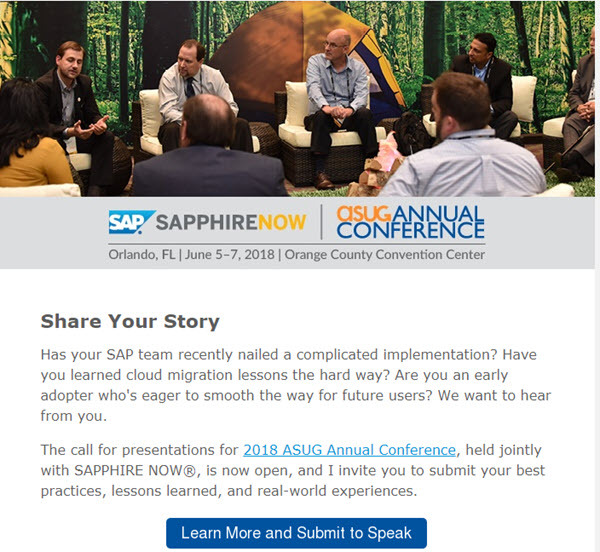 ASUG Annual Conference is co-located with SAP’s SAPPHIRENOW event, which is one of SAP’s largest events around the world. The event is packed with excitement. Go to this link which has all the details. When you enter your e-mail, either you have an existing account or you may be prompted to create a new account. Note you must use your company’s e-mail address. If your abstract is accepted, you receive complimentary registration, you get the opportunity to share your knowledge and showcase yourself and your company. I’ve also found when I presented that I learn far more than the audience. It’s the rehearsal, preparation, and the process. What are some tips to submit? Tips are also on this link. I would add the tip to “submit early” and “submit often”. Often abstracts are submitted at the last minute, and they may end up in the wrong track, and the committee does not have time to catch. Please also note the emphasis this year, as always, is on customer stories. If you are an SAP employee or a partner, I would encourage you to submit with a customer. Spelling counts! Also something from Jennie Moreau – “cut the fluff” and “hit and quit it” in your abstract. For Business Intelligence, our topics have changed. companies to make the right decisions. This group covers the products available as both cloud and on-premises offerings. Previous Behind the scenes of SAP TechEd – the perseverant SAP IT team!